CBR posted an interview with upcoming Daredevil creators Mark Waid and Paolo Rivera earlier today. There was also tons of preview art, by both Rivera and Marcos Martín, on display. What can I say? It looks fantastic! In the interview, and also highlighted by the accompanying art, Waid and Rivera once again underscore the emphasis on exploring Matt’s senses, which I think is just awesome. The Martín pages show some really nice page layouts and includes a wonderful use of humor and Rivera’s art is just pretty as hell. I can’t wait to see these pages in print and in full color. (And, speaking of the latter, it was also revealed today that the new Daredevil colorist is Spanish artist Javier Rodríguez). I only have one complaint: What’s up with the pre-WWII cane in Martíns panels? I really like his art here otherwise, but that’s one annoying little detail I hope he will consider changing down the line, especially with the reveal of the new design Rivera came up with. Okay folks, it’s way past my bedtime, but please discuss away! I love the detail in those images, especially of the backgrounds. I’m not as crazy about how DD himself looks though. I have mulled it over and I think what bothers me is the old school approach that others seem to like so much. I like how Batman’s suit/look has evolved over time to remain contemporary but DD in contrast looks like how he was drawn in the 70’s. Murdock’s cane is very last century as well, which makes no sense. That said, I am blown away by the emphasis on his radar sense and the focus on his perspective (how he senses everything happening in the world around him). The sound effects for instance are a nice touch. That is all just very, very cool. That artwork is too good for Daredevil. Really. If correctly inked and coloured (and maybe not by Hollingworth, who makes everything look the same), it would be terrific. As I said, too good for Daredevil. The writing will never cope with the quality of the artwork. It’s like something from another medium. Issac: I respect your opinion, but I think you seriously underestimate the potential of the DD character. He has been both serious and cinematic in the past, and he’s got more depth than any other superhero I can think of. Attaching artists like Paolo and Marcos to him makes sense in a way it wouldn’t on other superhero books. And clearly, they are excited to work on DD. They don’t consider him a “waste” of their talents. Why should we? All of the Marvel characters can be described as “products” if we want to completely strip away all the talent, artistry, and inspired writing that has shaped them into who they are today. Why diminish all of that? Anyway. The more I read from Mark, Paolo, et al… the more excited I get for July! Everything they say feels like music to my ears, frankly. I’m more amped up about this run than I have been for any of the recent creative teams. Optimistic! Regarding the penciling/art style, I guess you’re just more of a fan of modern art Andrew. Regarding Batman’s costume evolving, are you referring to the movies or comics? Because Batman’s costume has changed very little in the comics to make it contemporary. Same thing with DD, so of course his suit looks like it did back in the 70’s. The costumes haven’t really changed over the years for many characters, but the style and approach pencilers, inkers and colorists use has certainly diversified and changed since the 70’s. For some characters, I really wish they would update the costume. DD is definitely one of them. Don’t get me wrong, I do like the old look but I feel his costume could go through some minor changes in texture and such to make it more contemporary with little to no uproar. At least get rid of the underwear on the outside! Also, ditto to what Equustel said. Well said. Getting rid of the underwear for DD isn’t as much of an issue since the underwear is the same color as the rest of the suit, so most people wouldn’t miss it. It also helps that red is a more vibrant color to begin with. Something about this art reminds me of John Romita, clean lines, handsome faces, attention to backgrounds, etc. It makes sense coming off a rough story that was experimental and controversial to go back to a simpler formula as a symbolic cleaning up of the mess. 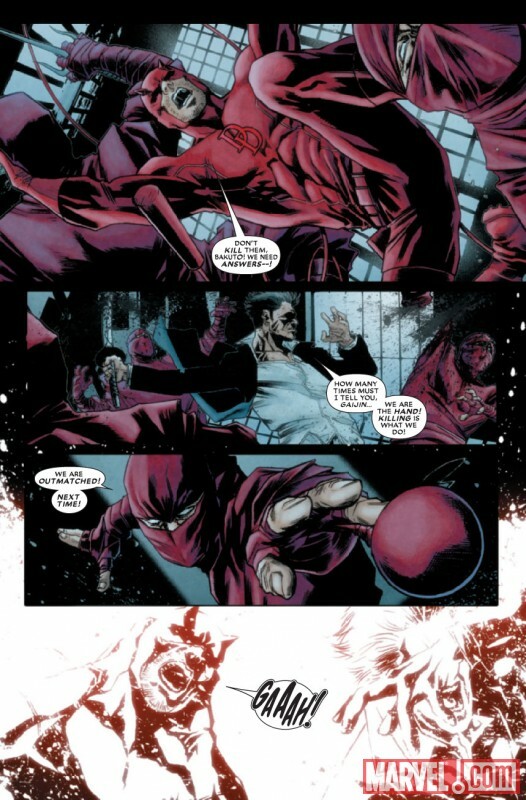 I like DD’s classic costume and I think the simple monochromatic look is cool but if you really look at it it’s subtly but significantly different than the original. Bill: Yeah, Paolo Rivera’s art reminds of Romita Sr’s art too. I love clean lines, so Romita Sr has always been one of my favorites. Can I just say one thing? I love you guys. This conversation is so wonderfully geeky and intellectual at the same time and I’m so grateful that the comment sections on this site are so devoid of the venom you find in so many other places online. @Andrew and AP: I’m sorry your comments earlier took a while to show up. The spam filter sends any comments with more than two links in it to be moderated rather than published immediately so I had to manually approve them. I don’t mind, of course, but just so you know. On the “underwear” issue, I don’t mind them on the outside as long as they’re shorts more than, you know, underwear. In reality, a man walking around in just a tight body suit, regardless of the material would look funny as hell. Yes, I’m looking at you Spider-Man! I’m just glad I have somewhere I can be a geek and talk about Ol’ Hornhead! I don’t have too many people I can talk to about the differences in DD’s boots over the years, just how his senses really work or what the hell is going though his head when he does something ridiculously stupid. Most people I know don’t know and/or don’t care about DD so it’s definitely a huge plus that we can discuss all things Daredevil here without rancor. No worries about the spam filter, I figured it was something to do with the links. I also read somewhere that Superman’s costume was based on what gymnasts wore at the time, so that’s why they started designing all superheroes wearing underwear/shorts. Come on, should a superhero really follow 1930’s gymnast fashion when designing his costume? Think about it. I know DD is more known as a noir-type chracter these days, but this art looks bright & energetic, a welcome contrast. Looking at the clean lines, fight choreography, the depiction of his radar sense, all this adds up to DD looking FUN again. Wow, that is some beautiful artwork. Can’t wait to see the finished product. Everything Waid and co have said about what they are doing with Matt psounds like exactly what the character needs. As long as Marvel leaves them alone to tell their stories, this should be something really special. 1. I have seen DD’s horns on the side of his head. Don’t care for it. 2. I have seen ‘divits’ in his mask-hole (the opening for his nose, mouth, and chin). I think that was Nord. This I liked. 3. Blocky double DD s Colan style. Prefer them modern. 4. His eyes white, not red. Hate this. 5. And to totally geek out (just for Christine), I hate that Nightwing carries escrima sticks that look just like billyclubs. Thank Scott McDaniel for that legacy. Boy, I love Marcos Martin’s art – that scene with Foggy and Matt crossing the NY streets is gooooorgeous. Three years late to this party, but when I took a look at Page 1 of Paolo Rivera’s art, I had to laugh at the “Friggin Daredevil!” entry for “book title”.